Just like people, every social medium has its strengths and weaknesses; its own little quirks and foibles. So how do you know which one’s right for you? Here’s an infographic that provides a snapshot of each platform’s pros and cons for you to compare at a glance. Search marketing got social a long time ago and, increasingly, brands have faced a decision whether to do the same or face falling behind the competition. Not all platforms were created equal, however, and some are more suited to one industry more than another. 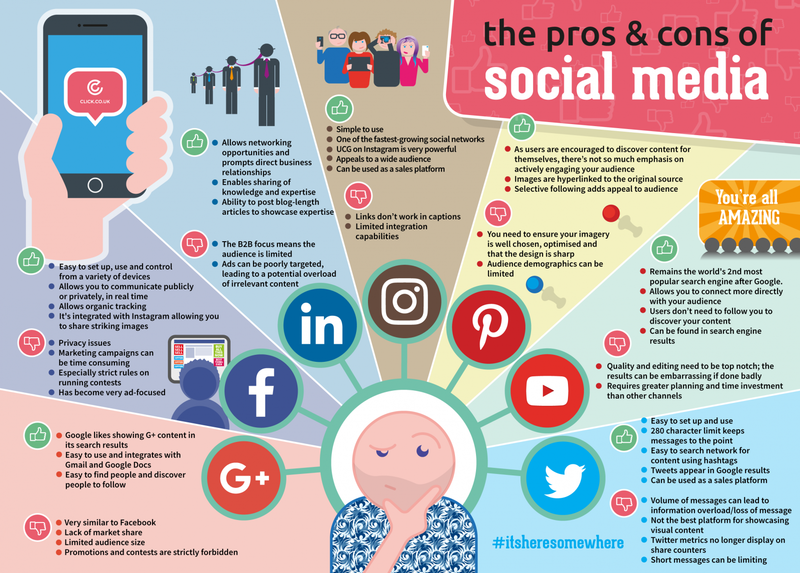 For those trying to decide where to focus their efforts, therefore, Click Consult has compiled a list of the main pros and cons of each of the main social media platforms. The easy to understand infographic below covers the main benefits and issues of each platform on which a brand may be considering increasing its presence. By downloading The Pros and Cons of Social Media, printing it or embedding it on your site, you can ensure that you and all members of your marketing team are able to make an informed decision as to which piece of content may perform best on which platform – freeing up time and increasing the chances of success on social. Click Consult is always looking to pass on its years of search marketing experience – and there are many more infographics available along with eBooks and blogs to help you get the most out of your search marketing. Alternatively, if you’d like to work with one of the UK’s premier and multi-award winning search marketing agencies, you can contact us today.